We hold a quarterly team day to ensure that we are nourishing our most important asset… our people. In an entrepreneurial environment, it can be hard to come up with the resources (cash, expertise, time) to create meaningful exercises that dramatically accelerate a team’s ability to form and perform, beyond the stereotyped foosball table and free sodas. Don’t get me wrong… we have our Friday Sales Meeting (a weekly all-company happy hour where you have to pound your tasty beverage if you are caught talking about work) and we regularly get the team together for outings like the Thanksgiving Texas Hold’Em Smackdown or the July 4 “Grill ’em.” But these are social events, intended to be casual, easy, and free flowing. At Windsor Circle, we actively engage each team member with a Myers Briggs Assessment and then spend 2-3 hours going through exercises to understand how various types of people interact, and how it applies to the people in our team as they express those personalities. Human Metrics has a quick and free assessment here. Typelogic has good descriptions of the various types here. John Fahlberg, a retired Target executive, has coached us numerous times on this disciple. If you’d like him to coach your team, visit his site, and tell him I sent you. Just to get the juices flowing, I thought I’d summarize some of the comments and observations from our experience yesterday. 100% Intuitive, 0% Sensing – This vector has to do with how people take in data. Sensing types do a lot of research, and then shape their world around the existing data. Sensing types seek “what is.” Intuitive types engage high level concepts and patterns, placing high importance on imagination. Intuitive types seek “what could be.” It was fascinating to find that in our team, we were 100% “what could be.” We theorized there was a selection bias here… that the startup environment attracted those who loved the art of the possible, and that the risk and unknowns of the very early stage process might drive those who seek data and structure away. It also made us think about next hires… might be good to balance us out a bit! “I hate being praised publicly” – One of our engineers, who has a strong expression of introversion, shared with me that he not only didn’t care about being praised publicly for doing well, that it actually made him uncomfortable. A well meaning extravert (like me) might sing his praises in a team meeting, completely unaware that this is actually a painful experience. What this specific team member expressed was that he was much, much more motivated by being given a thorny technical problem to solve and the time to solve it. Unlocking his zeal and passion for Windsor Circle, therefore, is much more about planning and allocating tasks than it is remembering anniversaries or publicly praising him. Brad’s Time of the Month and Carrie’s Internalization – My co-founder, who runs sales, holds responsibility for client renewals. During our monthly billing cycle with clients, there are always a few that raise their hand to cancel their contracts (primarily for non-usage on the clients’ part). And it drives Brad batty. He wants our clients to be successful. He wants Windsor Circle to be successful. And when he processes a few calls / emails in one day (triggered by the billing) he gets grumpy. Under stress, his personality type (ENFP) feels overextended and edges towards shutting down. One of his team members, Carrie, has a high social component to her personality type (ENFJ), and therefore internalizes others’ stress. They discovered that when Brad is in “his time of the month” that she also feels stress because she’s wondering what she has done wrong. Knowing the pattern will help them operate more smoothly. I Get Irritated by Those Who Won’t at Least Consider the Impossible – The book that we’re using details each personality type, and describes what irritates them and how they may irritate others. Two strong traits of mine are that I am drawn to things that others haven’t done before, and that I deeply believe that they can be accomplished with enough vigor, passion, intelligence and hard work. I have a very strong negative reaction to those who look for reasons why something won’t work instead of inventing innovative ways to actually pull it off. In reading my personality type handout, I discovered that it’s a known phenomenon that us ENFPs get irritated “by those who won’t consider the impossible”. And, interestingly, other personality types may become irritated by an overly optimistic and unrealistic approach to new projects that my personality type expresses in extreme situations. The awareness of types is what’s important here.. I Need Time to Process – My co-founder and CTO, Chris, is a strong INTP. He draws energy from having time to center, without distraction, and process things. His predilection towards logical, data driven, non-emotional information gathering and decision making means that in times of high stress, he needs time to go process things. My personality type in the same situation requires high degrees of social interaction and group brainstorming. Both approaches are fine… but under stress, operating without an understanding of what the other person needs is a recipe for conflict. Here’s a post about a specific experience that started off hard but ended up bringing Chris and I even closer as co-founders. We uncovered a lot of other interesting insights during our session. I hung the resulting charts in the kitchen area so that our team will see where we landed, how we interact and perceive the world, and how to engage one another in ways that will help us out-compete those who are not specifically working to build their teams with the intentionality that we are. I’m excited to be blessed with a team that works so well together and trusts each other with personal perceptions and sensitivities. It was amazing to me how often a team member would speak not only about how their personality type may become irritated by others, but how often they named how they might irritate others. That high trust is the hallmark of a good group of people who are pulling together to excel at a shared task and who are investing in each other. I had dinner last night with Chris Baggott, one of ExactTarget’s co-founders, and the founder of Compendium, and Bill McClosky, founder of eDataSource and Only Influencers. The war stories of these two entrepreneurs from the digital marketing space as they took risks, built companies, and followed their passions was inspiring and humbling. It hit me like a ton of bricks. It’s exactly the way I’ve felt my entire life… this (good) ache internally for newness, for creation, for problem solving. This longing. This muse. It’s certainly what drove me start BuzzBox (an idea which failed miserably!) and then Windsor Circle (which is celebrating several milestones right now!). My wife would tell you that the list is extensive, and ever growing (and thanks to Laurie for enduring all of the endless exploration of ideas that will certainly change the world!). Most of the ideas will never see the light of day. But some will. And maybe, just maybe, they will make something new and interesting in the world. Yes. “To aching for something new.” Cheers. Laurie (super star wife) and I were reading a little book called “Good Busy” this weekend. The author, Julia O’Grady, introduced a concept that fit well into the experience of starting a company. She shared that when people find themselves in unusually tough circumstances (death of a family member, struggling with an illness, etc.) that it is helpful to conceptualize driving through a tunnel. Normally, you’re zooming along the highway, blue sky and wind, and freedom to go where you want. Speed up, slow down, change lanes, pull over… do whatever feels good. But when you enter a tunnel, things change. Your options are severely limited. You have to do what others are doing. It’s dark and claustrophobic. Thoughts of being stuck and perishing in the tunnel pop into your mind and cause anxiety. There is very rarely any ability to turn around and go back… once you’re in, you’re in. That said, if you’re reading this post, you’ve probably made it through all of the tunnels you’ve entered. That familiar “light at the end of the tunnel” shows up at some point, and you breathe your first sigh of relief. You make it out and you’re renewed… blue skies again. The lesson is that tunnels feel constraining, risky, and uncomfortable when you are in them, but that they almost always pass. By recognizing that the constraints are temporary, you can set your mind at ease, do what it takes to get through the tunnel and pop through on the other side. The startup life is very much about going into a tunnel. You’re committed in ways that don’t occur in other career choices. You’re constrained financially. There’s a lot of obscurity… who knows when or how this will end. Your family is along for the ride. Things like college savings and home renovations all go on hold. Vacations are more basic, eating out is coupon-driven, and gifts shift to that which you can find on sale. Recognizing the experience for what it is… temporary… is comforting. The tunnel won’t last forever. The familiar light will appear again. The blue skies are ahead. And… just maybe… there are rewards on the other end of the tunnel that add a little something extra for those with the courage to persevere! One of our investors and mentors, John Fahlberg, is a retired executive who’s built and managed several companies, and has held executive posts with Target. Net: this guy’s got some time in the saddle. He does executive coaching these days to keep active, and we’ve been fortunate to have him run several sessions with our team. We did a standard Myers Briggs personality inventory early in our development, and he coached us through thinking about how to use the results to build a really strong team. One of the core concepts that he coaches us on was that extraverts (yours truly) often process ideas out loud and watch for cues from their colleagues that the ideas have or lack merit, and iterate accordingly. In other words, extraverts talk about a concept, watch for reactions, think about what they saw, and then talk more to iterate. It’s a very social process. Introverts, on the other hand, do that same processing internally. They think long and hard, using their intellect and their research to derive a conclusion. They think, then they share what they’ve thought about, and then they think some more based on the results. Cue the obvious observation…. Most technical types are introverts. Many sales and business types are extraverts. There’s huge potential for miscommunication and stress. When I (an extreme extravert), am working through a problem, I start brainstorming out loud to socially engage my team and find an answer. Chris, my CTO (an extreme introvert) is used to putting a lot of deep thought into something before communicating, so when he hears me list out several ideas, he assumes that I’ve already done a ton of diligence and am proposing a concrete list that we need to act on. Clearly, this can cause friction. The extravert can’t believe that someone could work on an important concept without engaging deeply with the group to find an answer together. The introvert can’t believe that someone could put ideas on a board that haven’t been vetted deeply before being communicated. What John taught us was for me to literally invoke the phrase “Talk Think Talk” to signal the beginning of a socialized thought process, and to give Chris room to breathe so that he doesn’t interpret the long and rapidly changing list of ideas as items that must be wedged into the development calendar. This has unlocked a ton of power because it marries the strengths of the socialized creative process with the power of the rigorous scientific development process. While Chris and I are about as opposite as you can be on the introvert – extravert scale, this mechanism has allowed our proclivities to complement one another and build on each others’ strengths. It helps that we have a lot of common ground in our personal values and perspectives on building Windsor Circle, but we’re thankful for a technique that has unlocked a lot of great collaboration. David Cummings posted some numbers about revenue growth and financial models in his blog. I took a moment to boil it down to growth projections to compare to Windsor Circle’s SaaS growth model. 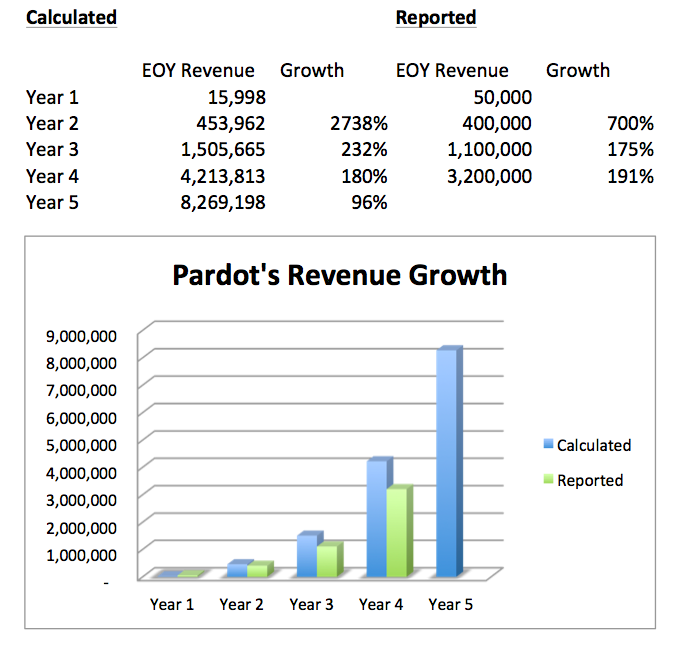 The first post, Key Moments in the Life of Pardot, gave some milestones for Annualized Recurring Revenue (ARR) at $1M, $5M, and $10M, and the approximate dates. I used these plot growth rates and map out growth. The second post, Financial Projections for Startups Hurt More Than They Help, lists revenue for the first 4 years. The data and graph below attempt to show these helpful metrics (thanks David for being so open). This is important for entrepreneurs, because you must think big (I’ve literally been asked by VCs several times “how will Windsor Circle be a $100M company in 5 years?”), but you must also bear in mind that the very best SaaS companies (ExactTarget, HubSpot, Pardot) achieved $10M by year 5 (and with the exception of Pardot, took millions in venture funding to achieve it). Thoughts? 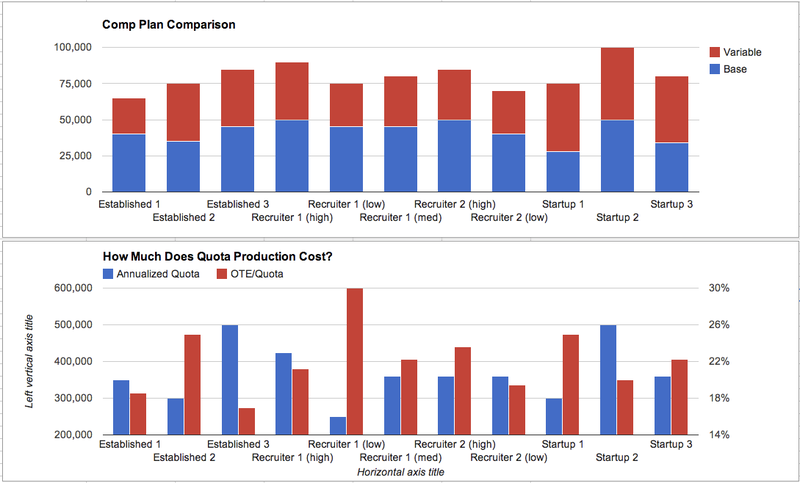 Do you have add’l data points re: SaaS growth models and benchmarks?